Seniors Joe McDonald and Kevin Larsen celebrate a quarterfinal victory over Florida Wednesday. The veterans look to extend their seasons Tuesday night at Madison Square Garden, where the Colonials will face second-seeded San Diego State in the NIT semifinals. 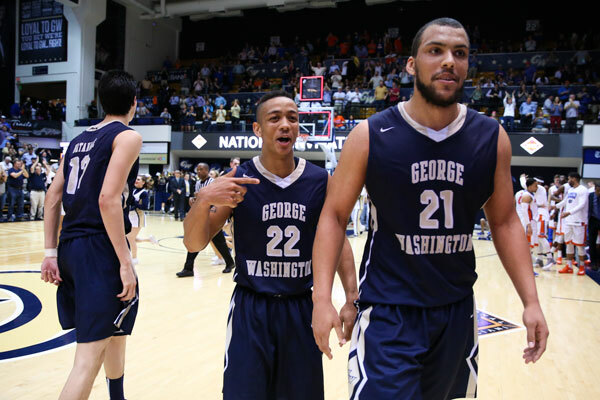 When: Tuesday, March 29 at 9 p.m.
On Tuesday, when GW takes on San Diego State in the world’s most famous arena, only eight Division I men’s teams will still be alive in major college basketball tournaments. The Colonials, who will play in the program’s first-ever National Invitation Tournament semifinals appearance, face an Aztecs squad that has won its first three games by an average of 18.3 points. The game will be a strength-on-strength battle: GW on offense and San Diego State on defense. The Aztecs have been on a roll, but had some struggles throughout the year that the Colonials will try to bring back. If they succeed, they’ll earn a chance to send seniors Joe McDonald, Patricio Garino and Kevin Larsen, as well as graduate student Alex Mitola, off with a win in the last game of their college careers. The key for GW will be to make SDSU look more like the regular season team that had the No. 173 offense in the country, playing in the Mountain West Conference instead of the NIT team that has scored 79, 93 and 72 points in three tournament wins. The Colonials had strong defensive performances against Monmouth and Florida, but the Aztecs have a lot of length and versatility. SDSU senior Winston Shepard is at the heart of this as the 6-foot-8-inch forward scores 11.4 points per game, adds 6.5 rebounds and can play any position on the court – and often depends on being able to shape shift to match up against opponents. This could be difficult against GW, however, because the Colonials’ offense can look very different depending on the game. Sure, San Diego State was able to run and gun to score 93 points against Washington one game before the team banged its way down low to beat Georgia Tech (outrebounding a team that was dominant on the boards in ACC play), but GW presents a more multifaceted offense. When GW’s defense has folded, the Colonials have consistently lost games. That’s likely to be true again against the Aztecs, but given that SDSU boasts the No. 2 overall defense according to Kenpom’s efficiency ratings, GW will need all facets of its offensive game to be clicking as well. The Colonials are capable of dominating the paint with Larsen and Tyler Cavanaugh. Cavanaugh, Garino and reserves like Mitola and Matt Hart add outside shooting. Garino and Yuta Watanabe are capable of big moments in transition. It’s difficult to have all these elements firing at once, but if the Colonials can come close, the Aztecs may struggle to contain all of them. GW also hasn’t been getting as much from the free-throw line as the team had been during the regular season. If the Colonials are due for a 20-plus point night from the charity stripe, it couldn’t come at a better time for them than Tuesday. Both teams will enter Madison Square Garden having won three games straight, but the Aztecs have won 21 of their last 24. The Aztecs come into the game with confidence and momentum. Sophomore guard Trey Kell and freshman guard Jeremy Hemsley add 12.7 and 12.2 points per game, respectively. Watanabe and Garino have done solid jobs on quick guards, particularly Watanabe on Monmouth’s Justin Robinson, but GW’s help defense will need to be there to handle both of them. If both Kell and Hemsley are able to get away from defenders, it will mask some deficiencies in SDSU’s game – like Shepard’s 39 percent shooting (23 percent from beyond the arc). One of head coach Mike Lonergan’s tricks, the 1-3-1 zone, won’t surprise SDSU skipper Steve Fisher, either. Fisher has also made notable use of the zone, employing it to win the Mountain West Conference title in 2014 against New Mexico. Fisher has made it a top priority for his team to avoid turnovers, though he did emphasize rebounding as well against Georgia Tech. But while the Aztecs handle the ball well (only 12.3 per game), their defense is more smothering than pressure-based, and they don’t force too many giveaways from opponents (12.4 per game). Turnovers weren’t a problem for the Colonials during the regular season, but GW committed 16 against Monmouth contributing to a 12.6 turnovers-per-game average in NIT play. That’s a bit more than the 11.4 turnovers per game the Colonials were averaging all season. It’s not a huge difference, but, against a high-caliber defense like SDSU’s, GW can’t afford to give up possessions. The bottom line: The Aztecs are the slight favorite as the No. 2 seed playing a No. 4 seed, and the Colonials will need a complete performance to upset SDSU. Still, with GW boasting wins over Virginia, Seton Hall and VCU, the Colonials probably have the higher ceiling, though the Aztecs did beat Cal earlier in the season. The game should be a tight one, and, like many of GW’s most pivotal games this season, will probably come down to how well the Colonials defend. And if the Colonials do advance? The team would play either No. 1 seed Valparaiso or No. 2 seed BYU, the two teams of the earlier semifinal game. Valparaiso is another defensive-minded team, holding opponents to 62.2 points per game aided by a 9.4 rebounding margin and nearly five blocks per game, while BYU is solid on both ends of the floor, though the slightly easier matchup of the two.